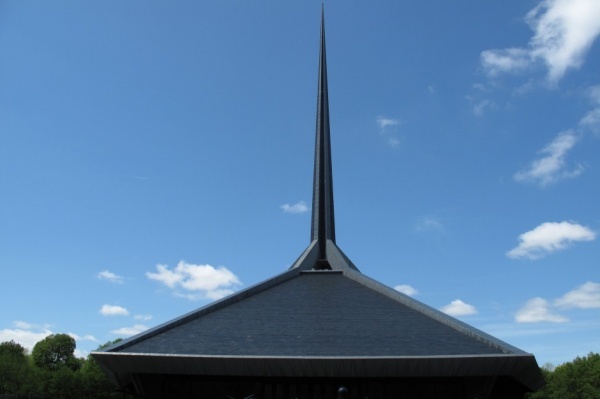 Located in Columbus, Indiana, the North Christian Church was one of the last buildings designed by famous Finnish architect, Eero Saarinen. Saarinen wanted to create a modern, contemporary church but also felt it was important to keep the interior design as a traditional place of worship. His final design was an impressive hexagonal building with a 192 foot central metal spire. The first worship was held in the church on March 9, 1964 and on May 16, 2000 was designated a National Historic Landmark of Indiana. In 2008, the slate roof was replaced. We supplied 220 squares of our North Country Unfading Black, 20” x random width x ¼” (154 squares of 20” x 12” x ¼”, 22 squares of 20” x 11” x ¼”, 22 squares of 20” x 10” x ¼” and 22 squares of 20” x 9” x ¼”).